So I'm having a problem while importing models, it gets to 25% and then it crashes. At 23% memory maxes out(32GBs) followed by my C drive maxing out at witch point it crashes. (I only have 23 Gbs left on my C drive) thing is UE is not installed on my C drive. My vault cache location is not on my C drive, My Project file is not on my C drive and i changed DerivedDataCache to off the C drive and it still overflows. Any Ideas? what would we have to donate to get access to hammuer.lib source? There are some little things i'd like to change/fix/exhance, as well as actually be able to debug a crash that I'm getting when loading certain maps. When do you think that HammUEr will be updated for 4.21? Yeah, can you please update it or tell us when it will be updated? Hi! i'm doing some modding of Lineage 2 for fun and very interested in your plugin, i need to extract bsp's from l2 client, but L2 was made in ue2, could your plugin extract bsp from ue2 based game? If it's possible, i'll definitely buy it. HammUEr doesn't exist to import random levels from games, it was created to help level designers that prefer CSG brush editors over more recent model-based level creation workflows to get their work into Unreal Engine. When I import my meshes non of them have textures wich means that when i import my map the map dosent have textures. It is something that I cant solve. No matter what. I even tried to re-import EVERYTHING again and still: Nothing. Which version of the 4.19 importer are you using? The fixed one? Also, are you sure your material setup is correct? This plugin rocks. It truly adds a new dimension to the ue4 editor. I have a problem though. When I import one of my maps made in Trenchbroom, I get what appear to be overlapping vertices (z-fighting). Other maps from TB work fine. Can you recommend anything? Animated models only get imported as static meshes, since they're only meant to be references to get your scaling right, and not as a means of using content you don't own the rights to. For your own animated content, you should have source files that can be imported by normal UE means. I see, I understand. Some models may be released under a license that allows me to. Has anyone tried this with Jedi Academy maps? I imported cache map to unreal engine but i see a lot of single mesh and material bugs can anyone help me how can i fix them? First off, thanks for this plugin, it's been a mega time-saver, and is bloody awesome. An option for imported brushes (not displacements) to be created as Additive UE BSP, instead of auto triangulation etc. Unreal's format does allow stuff like removing faces, no all nodraw and stuff can still be removed. It could just be useful in certain circumstances to have the brushes in brush format, so they are editable in unreal after. And of course, we can then convert them to static mesh from within unreal directly, later. Oh, another secondary one: Have some way for us to define custom classes, so we can link entities <-> Actors automatically on import! Perhaps with a callback that passes stuff like the static meshes etc to the newly instantiated actor, to hook things up. eg: In tactical Intervention, we have custom things like prop_breakdown and prop_hitzone. It would be coolio to be able to let hammuer instantiate a custom actor, instead of having to rename custom ents to prop_static so that they import in the correct place. Any possibility of adding support for COD1? It's based on ID Tech 3 and uses Radiant. Same .map file structure as DOOM 3, however upon importing UE4 just crashes. The COD map formats are heavily modified, unfortunately. Hello! I wanted to ask a couple of things about this plugin. First of all am I allowed to use this plugin for a paid game? Am I allowed to share this plugin with my team members and not anyone else if I bought it? Also if I want to map for a paid UE4 game (commercial purposes) using 3dsmax for example I need to buy it and not use the free student license so, what about using hammer for commercial purposes? I've tried to import materials/models from CSGO for about two days now and it ALWAYS crashes. Any idea why? Unfortunately, none of the things in this log have anything to do with HammUEr, so I can't really help you with this. Some of those dll errors seem to refer to intel vtune, but a quick google doesn't seem to give any decent solutions, apart from maybe needing administrative rights when you install/run unreal engine? Good luck, hope you figure it out. I had just recently found out about this plugin for UE4, and I am actually running into the exact same issue. I am able to get the textures imported just fine, but when attempting to import .map or files it finishes loading from master list, the I get an immediate CTD. I did try loading a .vmf which I had exported from Hammer Source SDK (originally on GoldSrc, used converter) and the map loaded into UE4 only once, any other time (same map) nothing showed up after loading and referring to master material list. I'm trying to import the csgo materials and textures, but HammUEr seems to not being able to read the VMTs. It is importing the textures, but doesn't create material-instances. LogTemp: Warning: Could not find , cutting down to smallest identifier. There was a change to the UE API I wasn't aware of, which led to this problem happening. I've uploaded a new version, so please download "HammUEr 1.8 for 4.19 fixed" and try again. Edit: Yes, with the new version it creates materials-instances and decals as expected. The plugin should work with 4.19.2 as uploaded, so something might have gone wrong while downloading/extracting it. Please download the new fixed version and try again. Can you please upload a 4.19 fix version for source builds? I'm also having this exact problem, tried downloading again a couple times. Warning: ModuleManager: Unable to load module 'HammUErRuntime' because the file 'C:/Users/Josh/UnrealEngine/Engine/Binaries/Win64/' was not found. the hammuer dll's are in the plugins binary directory. why is it looking in the engine binaries? Only the "flat_normal" and the "HammUErBaseMaterial" show up and the "HammUErDecal" won't. i couldn't figure out what's wrong. Weird, if the others show up, it should show up as well. If not, there's an example of what it should look like in the manual on page 6 (lower picture), so just build something that looks like that and use it instead. it takes me 2h+ importing textures and models from csgo to UE ive tried a different disk still didnt fix any suggestion on how to make it go faster? Unfortunately, there's a lot of data to import, and there's really nothing you can do to make it go faster. You only need to do it once, tho. Does the 4.18 version work with 4.19?? Ah nice, I managed to get what I needed with 4.18 and migrated it to 4.19. But still great job on the plugin. Hi, when I import textures or models, my C:disk will be used. But I use D:disk, why? I... have some trouble understanding what you're asking, but files that are imported end up wherever your unreal engine project is (because they need to be converted to something UE understands), which I guess is somewhere on your C drive in your case? 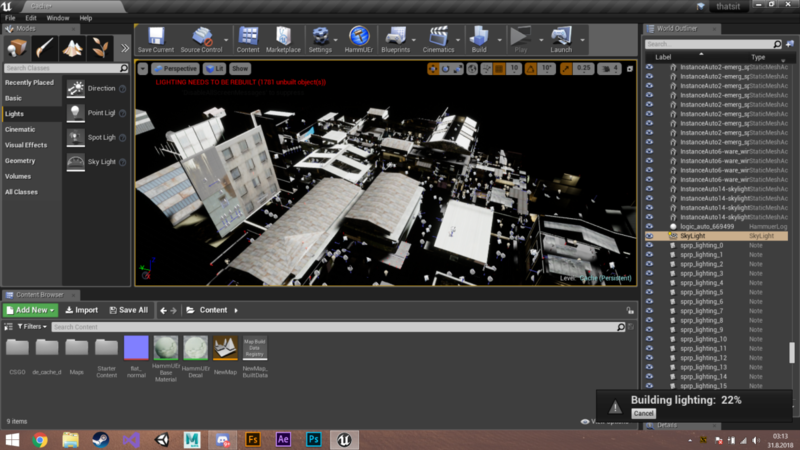 Unreal Engine uses a Cache to store temporaly your materials and meshes. You can change this folder-destination to your other drive under Edit->Editor Preferences and then under General->Global->Local Derived Data Cache. The 4.15 builds are pretty ancient by now, so hopefully a move to a newer one should fix this. I am still having issues with the 4.15.3 version of the tool. I am able to get all the materials and models over, but importing the .bsp still causes it to crash. Did you mean .vmf file? HammUEr has no support for compiled bsp files. Can you put the vmf on pastebin or google drive or something so I can test it locally? Sorry for the delayed response. Here is the vmf that imports just fine in 4.18, but it won't in 4.15. I don't have access to my code archive at the moment, so I can't really check with an actual 4.15 build, but my guess is it's got something to do with the displacements? Hallo, when I want to import props with porpUEr it all process and say done. Then I close that window and it wasn´t anywhere after restart too. What I need to do ? Thanks. If you selected one or more files, please check the log to see if there were any errors while importing. Is there any settings in HammUEr that I can change to fix this? Try to use a nodraw material for faces that can't be seen, and grouping the walls together. All the walls on the map or just sections of the walls? Hi. So this is a great piece of software. However, I am unable to import my .vmf in the 4.15 version of UE4. I am able to get the textures and models over, but it crashes the engine when importing the .vmf. I've tried a couple different systems and a few new Projects. Now I don't seem to have this problem with newer iterations of the engine and I haven't tried older versions. I wanted to add to this, I just tried 4.14 and it does the exact same thing. The pre-4.16 builds are rather old by now, and even Epic doesn't really support them any longer, officially. It works beautifully in 4.18, but I'm trying to import my work into PavlovVR (which appears to be built in the 4.15 version of the engine, or the template for it is). I would be happy to import the assets into 4.18 and migrate them to a project from older version but that doesn't seem to work either. If it helps, the project log hits me with with "Failed to load ANSI text file: [users/x/x/x/x/x/x/x] materiallist." before crashing. I also tried rebuilding the masterlist but that didnt help either. If there is another way to work around this, I'm open to suggestions. Do you have non-basic a-z 0-9 (so accented, asian, whatever) characters in the directory names/file names/material names? I flipped through them all and didn't notice any unusual characters in the names. Hi, I'm having a problem where the HL2 texture metalfence004a isn't getting imported. Just tested it, and it should import fine. It does seem to point to the texture Models/props_c17/fence_alpha, so if it couldn't find that, that might be why? When trying to compile, I get "ERROR: Could not find definition for module 'HammUErRuntime' (referenced via Test.uproject -> HammUEr.uplugin)"
The simplest way to reproduce is start a new project (blank or FPS) and compile from in-editor. It will succeed. Then add HammUEr as a plugin, restart the editor and compile again. It will fail. Am I perhaps missing some extra step needed to compile code? Just to clarify though, the actual tools do seem to work in the editor. I can import my Source materials and maps just fine. It's just the compile step that fails. Ah, yeah, that's a kinda tricky one I keep forgetting to explain/add to the archive. 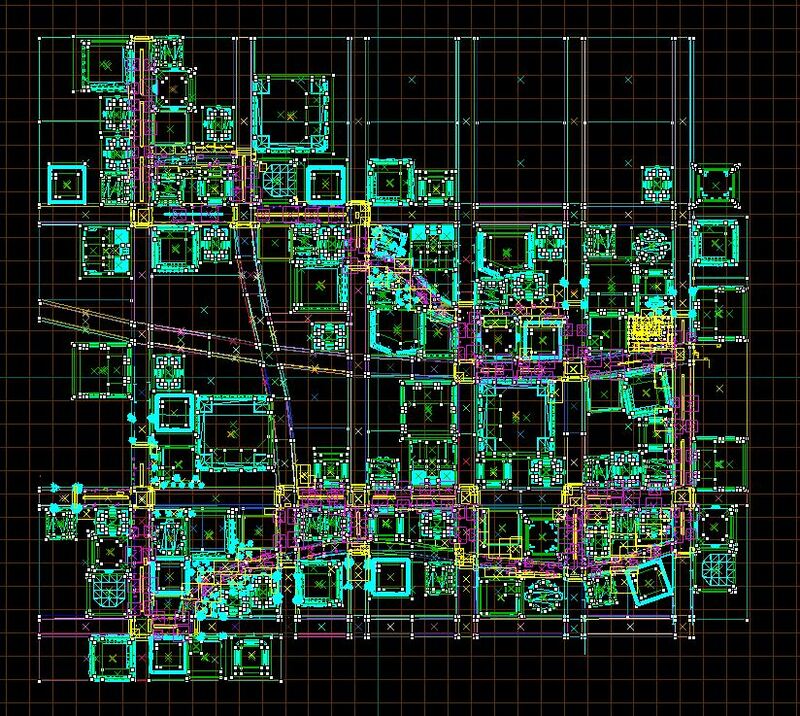 Compiling and packaging your project shouldn't be a problem any more. Let me know if you do run into any more things or have questions. Hey there. It does a quite good job, but is there a possibility to add the ability import the Brushes as UE BSP Brushes? It would require rebuilding the pipeline (since people explicitly didn't want anything to do with UE4's BSP tools), and wouldn't support everything, but I can try and fork a build that does that. Wouldn't happen overnight, though, so don't hold your breath. Hi, I would like to port my Soldier Of Fortune 2 maps, any issue about compatibility with SOF2 ? I have the .map files made with GTKradiant. Thank you. Don't know anyone that's tried importing SOF2 maps yet, so I wouldn't be able to give a definitive answer, but I know people have imported Jedi Knight Academy maps without too much trouble, so it all depends on how 'vanilla' Raven kept the map format, I guess. I could try importing one, if you put it online somewhere? What's the proper way to deal with seams in between brushes that will inevitably occur? I'm importing a simple map with a couple rooms in and there are very obvious seams in between the brushes, and also between the floor and the walls. Obviously this occurs a lot with modular maps in UE4 but does Hammuer offer a solution to help alleviate this? can i pay it with paysafecard? Unfortunately, I don't think itch.io supports paysafecard yet.